If you’re a leader in the energy industry, one of the largest risks your team members are facing every single day is strains and sprains- specifically those related to the shoulder. 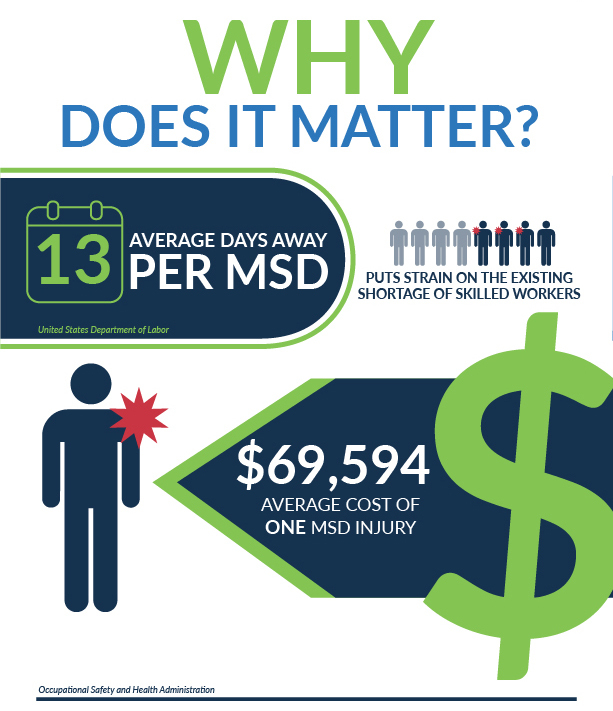 These injuries are common, costly and highly disruptive to operations. However, they are also preventable. Read below to get a better understanding of what employers can do to solve shoulder injuries among their workforce. 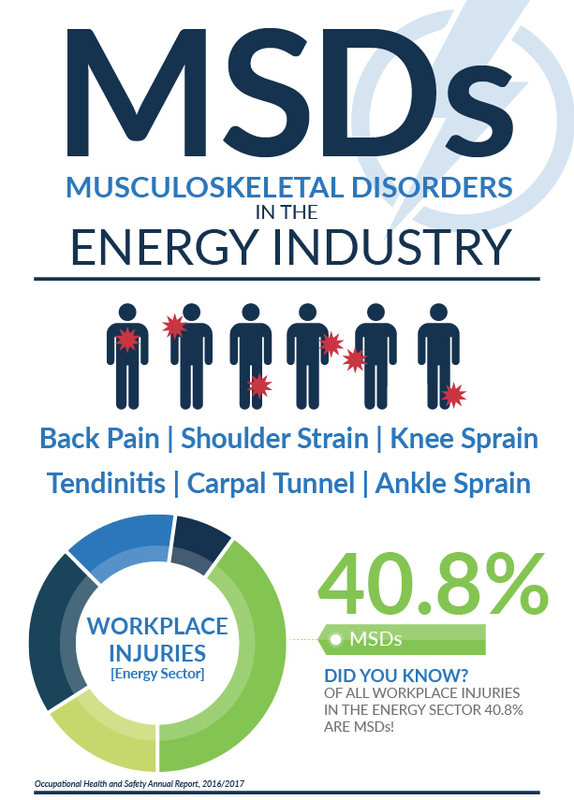 Musculoskeletal disorders in the energy industry make up 40.8% of injuries according to the Occupational Health and Safety Annual Report, 2016/2017. That’s significantly higher than the average across all industries, meaning on average employees in the energy industry are experiencing far more back pain, shoulder strains, knee sprains, tendinitis, carpal tunnel syndrome, ankle sprains, etc. Looking more extensively into the trends in energy sector injury data, it becomes clear that one body area is getting injured at a much higher rate than average. 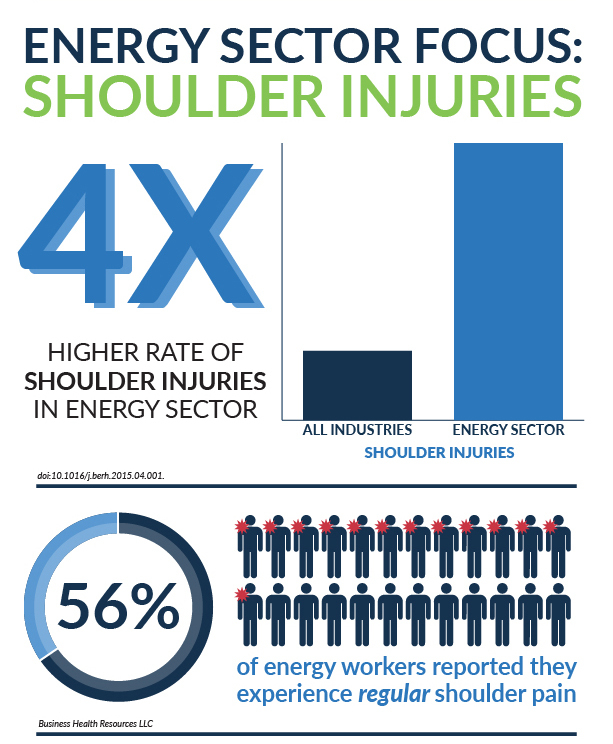 Employees working in the energy industry experience on average a 4 times higher rate of shoulder injuries than employees across other industries. Even more significant is that according to Business Health Resources, 56% of energy workers reported that they experience regular shoulder pain, suggested a high risk for eventual injury as well as an impaired ability to perform their job optimally. With the ongoing shortage of skilled workers in the energy industry, taking one employee out of work for a few hours can have a huge impact on your operations. Now consider taking them out of operations 13 days. That’s essentially what each MSD is doing to your operations based on the Department of Labor’s estimation that each MSD requires 13 days away. It starts to become clear why the Occupational Safety and Health Administration cites that each workplace strain costs a company on average $69,594. Clearly, the need for addressing shoulder injuries is pressing for a company’s long-term success. However, traditional approaches like stretch and flex programs and ergonomics on their own have largely proven to not be enough to make a lasting indent on injury rates. 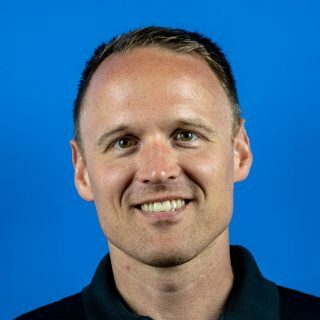 Instead, a holistic approach that addresses a company’s shoulder injury risks from all angles – the person, the job task, and the company culture is the way to real and lasting change. The first step towards reducing your team members’ risk of injury is improving their shoulder mobility. Due to the prevalence of overhead work in the energy industry, an employee’s range of shoulder motion often becomes limited. The result of this limited mobility is increased wear and tear on the joints and surrounding muscles. By utilizing recovery tools and tailored activities that prepare the body for movement, your team members can effectively improve shoulder mobility and reduce their chance of injury. 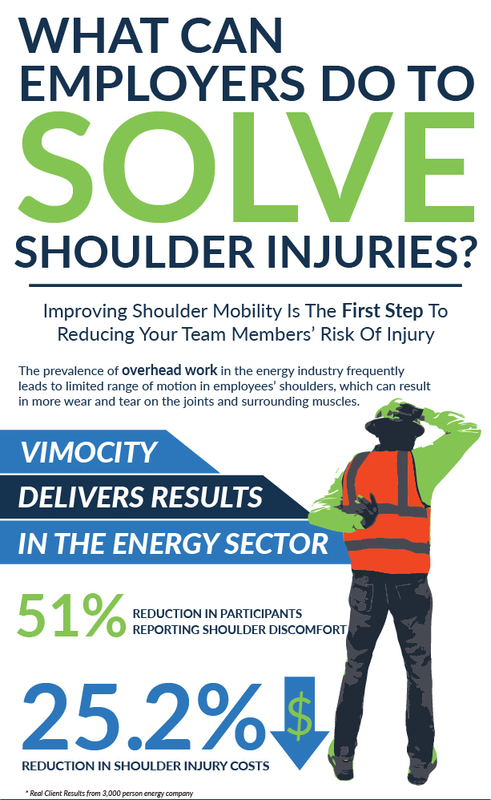 Vimocity has been fortunate to serve thousands of hard-working men and women in the energy industry to empower them to reduce their risk of developing a shoulder injury. Overall across wind, power, gas, and oil, we’ve seen on average a 51% reduction in participants reporting shoulder discomfort. Specifically for one client, this reduction in injury risk resulted in a 25.2% decrease in costs related to shoulder injury claims. Shoulder injuries are NOT just the cost of doing business in the energy industry. If you would like to learn more about Vimocity, visit their website here.